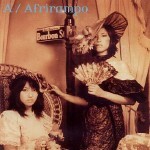 Ultra lunatic girl duo Afrirampo have neatly filled a long-standing idiot-savant gap on the Osaka underground scene. Their latest release is a CD-extra on the AMT label. The girl’s career to date has been unprecedented: formed in May 2002, word of their mind-crushing performances spread like wildfire and they immediately became massively popular. They’ve already played two overseas tours, and in the summer of 2004 they opened for Sonic Youth in Europe – and usually ended up invading the stage during Thurston and co’s sets. After Cotton left AMT in the spring of 2004, plans were rapidly hatched for an AMT/Afrirampo fusion unit, but the girls suddenly upped sticks and disappeared off to Africa, where it seems they spent two months living in a pygmy village and laying down some tracks with the natives. And somehow they also found time to jam with Keiji Haino and Munehiro Narita (High Rise) too! Releases to date include a CDR on their own label (reissued on CD with different tracks in autumn 2004 under the title “A”), and a mini-album on the Osaka label Gyuune, released in summer 2004. The AMT label release is a reissue of a CDR of early Afrirampo recordings, produced by Kawabata Makoto and digitally remastered by Yoshida Tatsuya (Ruins). It contains different tracks to “A”, with additional unreleased studio recordings and video clips and a photograph file personally selected by Oni and Pikachu. These recordings are world-shaking in their new generational ultra-sensibilities, and moved even Kawabata to dub them “mutant psych”. Limited edition of 1000 copies.